**Please confirm the details with the restaurant for the most up-to-date information. 273 Kitchen allows you to choose three courses for $55 (First, Second, Third course) and a dessert on them. Angelina’s offers a prix fixe dinner menu (appetizer and entree) Monday through Thursday 3-closing for $29.95. Wednesday is pasta night at Anna Maria’s. 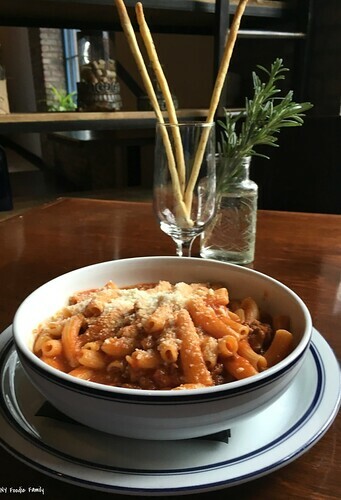 Enjoy 2 courses for $19 (first course and a pasta). The restaurant is open 5-9:30 PM. Casa Rina has a $20 three course dinner available Sunday through Wednesday. Thursday they offer a $25 four course price fixed dinner. Monday through Friday they also have a special three course early bird dinner for $18.95 that includes a glass of wine. Crabtree’s Kittle House offers a three-course Prixe Fixe dinner menu Sunday through Friday for $39. Eastchester Fish Gourmet offers a three course menu for $32.95, from 5-6:30 PM, Monday through Thursday. The menu changes daily, based on what is available at the fish market. Wednesdays Fin & Brew has a three course Prix Fixe Menu for $34 per person. Golden House has a $17.95 dinner special Monday through Thursday that includes a choice of soup, appetizer and dinner (from selected items) and house special fried rice. There is a 2 person minimum. Hudson Anchor has a 3 course $19.95 Prix Fixe Menu. The website does not specify days and/or times that this menu is offered. Please check directly with Hudson Anchor for additional information. The Hudson Room offers a 3 course Prix Fixe meal for $32.95 (appetizer, main, dessert) Tuesday and Wednesday. L’INIZIO offers a 3-Course Prixe-Fixe dinner menu for $33, Monday through Wednesday. Sunday they have a burger and a beer deal for $18. Mima Vinoteca offers a three course pre theater dinner for $39. For the month of February, Red Hat on the River is having a Winter Bistro special. Sunday through Wednesday (not offered on Feb. 13) they have a 3 course dinner for $32. 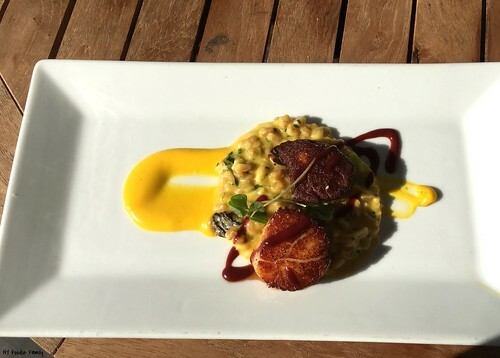 Risotto Night Prix-Fixe dinner is offered Sunday, Tuesday & Wednesday. $25 includes a select appetizer, risotto and dessert. Saint George Bistro offers a Two Course Prixe-Fixe menu for $25 weekdays, Tuesday through Thursday. Sundays they offer a Family-Style dinner for $29 per person which includes an appetizer and entree for the table to share. If you know of any other dinner deals in Westchester County, please let me know in the comments below and I will add it to this list! I’ve been posting various holiday gift guides these past few weeks. However, there are some unique gifts that you can give to families living in Westchester County. Check out this post that I shared on the Westchester County Moms Blog last year for some holiday gift ideas especially for Westchester County Families! While these places may not sell gift certificates, you can give money with a note for its intended use, or ask for a family experience, to these Westchester County family fun venues. Grand Prix New York (Mt. Kisco, NY) -This venue has Go Karts, bowling and an arcade. A full day of fun for families with older children. Legoland Discovery Center (Yonkers, NY) – Designed for children ages 3-10, this venue has 2 rides, 10 build and play zones and a 4D cinema. Located in Ridge Hill, there are several restaurant choices nearby for lunch or dinner. 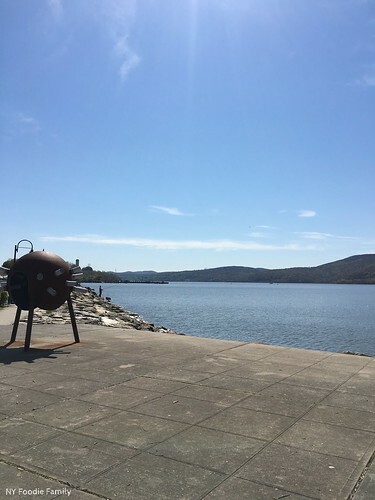 Spins Hudson (Peekskill, NY) – Your family can have a day of fun here. There’s an indoor ropes course, arcade and laser tag in this one venue. Winston Restaurant has been a welcome addition to Mount Kisco since 2014. Named after the dog owned by Executive Chef Michael Williams, the restaurant serves New American cuisine using fresh, high-quality ingredients. I dined at Winston back in December of 2014, during the restaurant’s inaugural year. Even then, my husband and I were impressed with the quality and flavors of the food. It appears that Winston has maintained that high standard of food and service to bring you a memorable dining experience. Executive Chef Michael Williams recently debuted a new fall menu that I was fortunate enough to get a preview tasting of. Believe me readers, you will not be disappointed! The dishes featured below will be replacing some of the summer-type dishes off the restaurant’s a la carte menu. Your first decision will be which tasty cocktail to order. And let me tell you, it won’t be an easy one! While Winston has a full service bar and extensive wine list, you will want to try one of their signature cocktails. The fall menu includes (pictured clockwise from top left) a Spiced Apple Margarita, Blueberry Dash, Ginger Redemption, Passion Fruit Bellini, The Herbed Pear and a Pumpkin Mojito. The only other drink, not pictured, is the Gentleman Fig. I love sweet drinks and the Passion Fruit Bellini was right up my alley. Since I had to drive home (and I might be a lightweight) I didn’t try any of the other cocktails. They all have such interesting combinations of flavors and ingredients, and appeared to be well-liked by my fellow diners. The fall menu includes four new starters (pictured above clockwise) Vegetable Spring Rolls, Beef Negimaki, Beef Carpaccio and Gruyere Potato Dumplings. They were all delicious but I highly recommend the potato dumplings and the carpaccio. The beef carpaccio is topped with an arugula salad and is a nice light dish to start your meal. 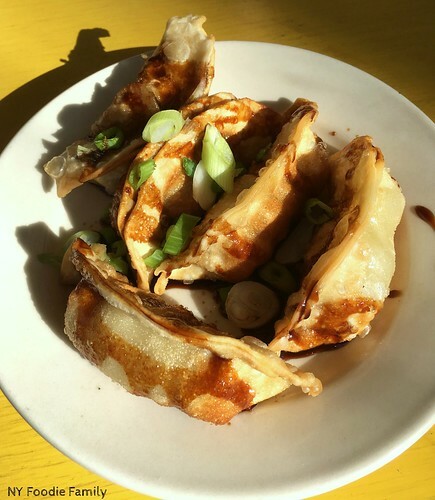 The potato dumplings are small, fluffy pillows of deliciousness. Accompanied by butternut squash, corn and asparagus, this dish embodies the goodness of fall. The portions are large enough for sharing so why not get both?! Chef Williams knocked it out of the ballpark with the new entrees on the fall menu! The four entrees (pictured above clockwise) include Pan-Seared Diver Scallops with Cannelini Beans, Chipotle Encrusted Cod atop a Butternut Squash, Corn and Brussels Sprout Leaves medley, Hudson Valley Magret Duck Breast with a Moroccan Honey Glaze served with a potato gratin and roasted cauliflower and Asian Braised Pork Shank atop a combo of Fingerling Potatoes and Savoy Cabbage. Honestly, they are all delicious and I can’t pick a favorite. I think it really depends on what you’re in the mood for. The cod has a bit of a kick from the chipotle crust, but isn’t overly spicy. The braised pork is so tender it falls off the bone. 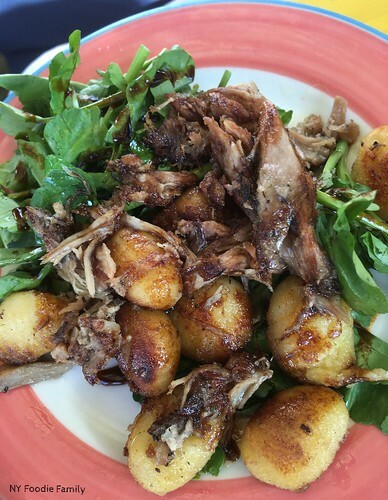 I love duck and the Moroccan Glaze is on point. And look at the perfect sear on those scallops! Again, I recommend ordering different entrees than your dining companions and sharing. Finally, we can’t forget about dessert. No matter how stuffed I am, I always take a peek at the dessert menu…..just in case there’s something that I have to try. Apple Tart served with vanilla ice cream is the new addition to the fall dessert menu. The nine piece assorted Cookie Plate and The Dirty Winston, a chocolate hazelnut layer cake served with raspberry sorbet are mainstays on Winston’s dessert menu. My advice: skip the cookie plate. If you’re going to splurge on dessert, really splurge! Depending on your sweet preferences both the apple tart and Dirty Winston are really good. However, if you love creme brulee, like I do, you must order the creme brulee trio. While I didn’t sample this dessert during my most recent visit, speaking from my prior dining experience, they are really good! The flavors change seasonally. 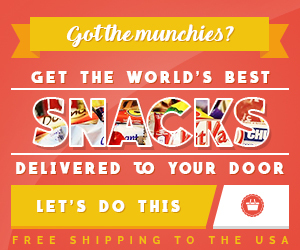 Are you salivating yet?! Winston will still be serving their new fall menu from now until the spring. Sunday through Thursday they also have a Prix Fixe Menu. I had never thought of Winston as a “family” restaurant. However, they have a kids menu featuring favorites like a cheeseburger, chicken fingers and pasta. The whole family can enjoy a great dinner out! Parking: Street parking available in front of the restaurant. Village Center Parking Lot is located behind the restaurant. Meters enforced 8 AM – 6 PM Monday through Saturday. Free parking Sundays and holidays. Reservations can be made via phone or through OpenTable. Where are all my fellow food truck fans? On Sunday, September 10, come join me and fellow foodies at Empire City Casino at Yonkers Raceway in Yonkers, New York. The Journal News Media Group is pitting the best food trucks from New York against the best of New Jersey in a Food Truck Mash-Up. Your vote will help determine who wins bragging rights! The current food truck line-up includes Carnivale Donut Bar (“over the top”shakes, ice cream donut sandwiches and stuffed mini donuts), Dough Nation (pizza), Farmers and Chefs (Hudson Valley, farm fresh, local, in-season dishes), Frites of NY (different kinds of street fries), Glazed and Confused Donuts (mini donuts), HAPA Truck (Asian Fusion- tacos, burgers, sides), Kona Ice (shaved ice), Los Viajeros (tacos, burritos, quesadillas), Meatoss Food Truck (Brazilian churrasco), Bacon Me Crazy (“hand wrap, roll & sprinkle your favorite foods with mmmm…..bacon!”), Empanada Guy (empanadas and traditional Latin dishes), Callahan’s Hot Dogs (hot dogs, burgers, fries), Walter’s Hot Dogs (hot dogs and fries), Three Little Pigs BBQ (BBQ meat, sandwiches, chicken), The Souvlaki Truck (Greek), Stuf’d Truck (gourmet sandwiches and sweet bites), Luke’s Lobster (seafood), Waffle de Lys (Belgian and savory waffles), CheezeN (gourmet grilled cheese), The Guac Spot (avocado-inspired eats), Jimmy Dawn’s Cheesesteaks (cheesesteaks and fries), Angry Archie’s (seafood) and Aroy’d Thai Elephant (Thai food)! I’ve perused the menus and the hardest decision you’ll have to make is which trucks to try! These are not your average food trucks, with most of them having accumulated multiple awards in the food truck circuit. The trucks will be offering their regular event menus at the Mash-Up. Prices for food items vary with each food truck. After taking a quick look at some of the menus online, many of the burgers, sandwiches, tacos, “mains” etc. average $6-$12 per item. The trucks take both credit cards and cash. If needed, ATMs are available inside the casino. After you’ve eaten your fill, don’t forget to vote for your favorite truck! At the end of the event, a winner will be crowned. Are you ready to get your tickets to the Food Truck Mash-Up? Tickets are available on lohud.com for pre-purchase. Early admission tickets are available for $20 (online only). This enables you to access the event at 12 PM and get $5 in Food Truck Mash-Up Cash. Plus, there will be drink specials during these two hours. General admission tickets can be purchased online for $5 or at the event for $8, with admission beginning at 2 PM. Kids under 5 are admitted free. All pre-purchased admissions include $10 of free play at the casino. Plenty of free parking is available at Empire City Casino. The Casino also provides free shuttle service from the Mount Vernon West Metro-North train station. During the event, Rockland Nissan, sponsor of the Food Truck Mash-Up, will be giving away a 2 year lease on a new Nissan Sentra. This is going to be a fun-filled family event! Daddy Pop and DJ Lax will be playing live music throughout the day and their will be carnival games and activities for the kids. Bring a blanket or foldable chair so you can sit back, relax and enjoy a day of foodie family fun. For tickets, directions, and additional info, check out the lohud.com site. Valentine’s Day is less than two weeks away. If you are planning on going out to dinner with your sweetheart, reservations are a must! Here is a look at some of the area’s restaurants that will be offering special Valentine’s Day menus. Most other restaurants throughout the area will be open and serving their regular menu. Regardless of where you decide to eat, be sure to make reservations now! Please check the restaurant’s website or call for the most up-to-date information. Additionally, please note that prices listed below do not include tax and gratuities. Benjamin’s Steak House is offering a 3 course Valentine’s dinner menu for $89/person. Dinner is served 4-10 PM. Gaucho Grill is offering a special 3 course dinner for $65/person. Dinner hours are from 3-10 PM. Half Moon is offering a special 3 course dinner for $65/person. Dinner hours are 5:30-10 PM. Harvest-on-Hudson is open from 5-10 PM on Valentine’s Day. They are offering a special three course dinner for $69/person. From 5-11 PM, The Hudson Room is offering a 4-course dinner for $70/person. At 6:30 and 8:30 PM there will be live jazz musical performances. The French restaurant is having two seatings, 5:30 and 8:30 PM. The three course dinner costs $90/person or $140/person with wine pairing. Modern on the Rails is offering a four course Valentine’s Day menu for $65/person. The restaurant is open until 10:30 PM. From 5-10 PM, diners can enjoy Chef Ethan’s 3 course prix-fixe menu. The dinner costs $78/person or $118/person with wine pairing. One Twenty One is taking Valentine’s Day reservations from 5-9:30 PM. Chef Beck Bolender is preparing a 3 course pre-fixe menu for $65/person. Plates is having four Valentine’s Day seatings, with a 3 course prix-fixe menu. The 5:00 and 6:30 PM seatings cost $65/person and the 6:30 and 8:00 PM seatings cost $85/person. 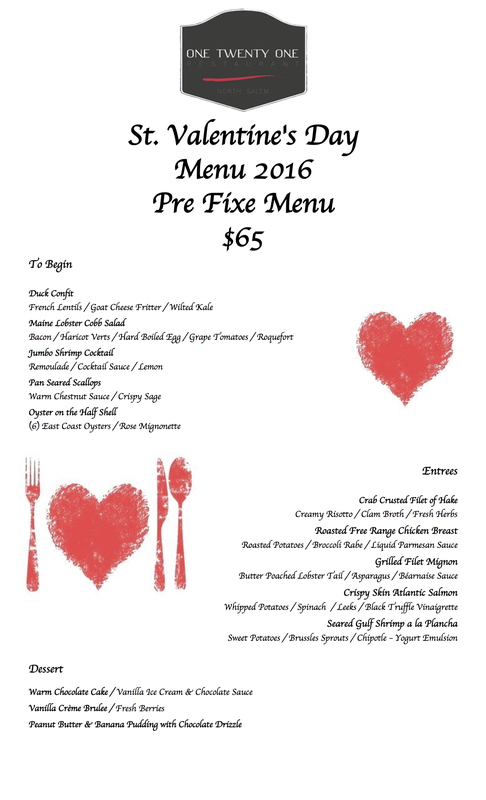 Red Hat on the River is offering a special Valentine’s Day menu for $72/person plus gratuities. They also have four special Valentine’s Day cocktails that they will be serving that evening. On Valentine’s Day, enjoy live music while you dine on Rosemary and Vine’s 3 course prix-fixe menu. The vegetarian menu costs $45/person and an additional $28 for a wine pairing. The restaurant is open until 9 PM. Thyme is offering a 3 course menu as well as a complimentary glass of champagne and a chocolate rose for $90/person. Dinner hours are 4-10 PM. The Arch is serving a 4 course Valentine’s Day menu from 5-9:00 PM for $85/person. Hudson House River Inn has special 3 course Valentine’s Day menu for $47/person. Their regular menu is available to order from as well. The restaurant is open for dinner from 5-9 PM and they will have a keyboardist playing live music. They also have special Valentine’s Day overnight packages as well. Jaipore has a special Valentine’s lunch buffet served from 12:00-2:30 PM for $15.99/person. They are also offering a special dinner buffet from 5:00-9:45 PM for $25.99/person. This Latin eatery is offering a 3 course prix-fixe menu for $55/person, which includes a dessert to share. The restaurant is open from 3:30-9:00 PM. BV’s Grill is offering a special three course Valentine’s Day menu on Saturday, February 11 from 4-11 PM as well as on Valentine’s Day from 5-10 PM. The dinner costs $150/couple and includes a champagne toast and dancing. Quinta Steakhouse is offering a special Valentine’s Day a’la carte menu as well as their regular dinner menu. Dinner is served from 5-9 PM. Sixty 5 on Main is offering two seatings, 6:30 and 8:30 PM. Ginetta’s Vendetta Band will be playing live music beginning at 7 PM. They are offering a 4 course dinner with a complimentary bottle of red, white or sparkling wine for $130/couple. 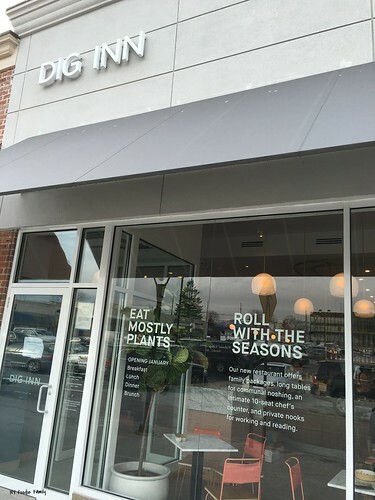 Dig Inn Rye Brook Opens Today! 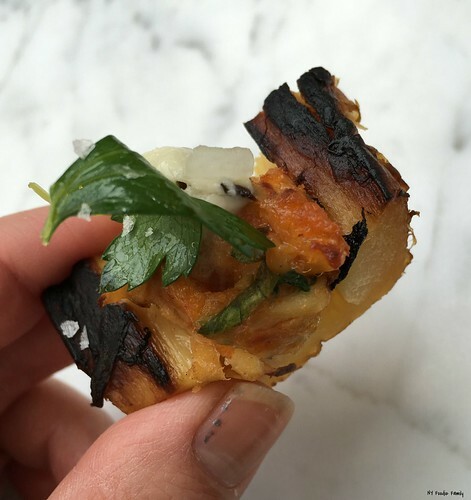 *I was invited to a preview lunch experience at Dig Inn. However, all thoughts and opinions are my own. 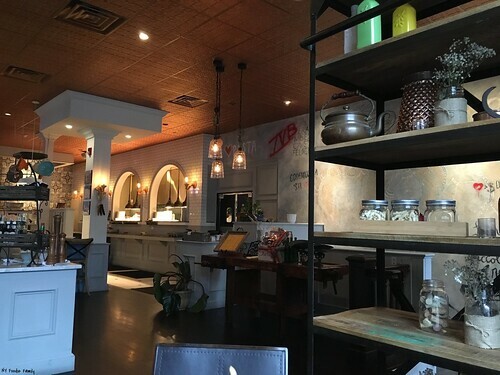 This past Tuesday I was invited to a preview lunch at Dig Inn in Rye Brook. 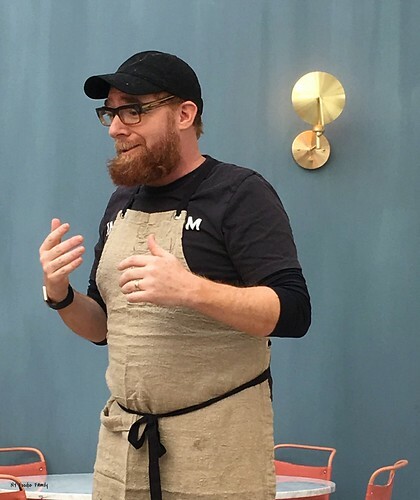 Adam Eskin, Founder & CEO of Dig Inn, opened his first restaurant in 2011. 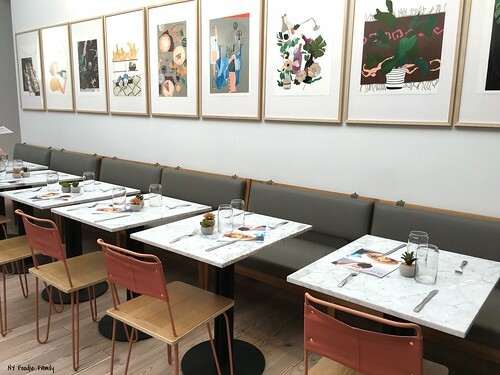 This is Dig Inn’s fourteenth restaurant and first Westchester County location. Located at 112 S. Ridge Street, Dig Inn offers a new dining option to the Rye Ridge Shopping Center. And it officially opens today! When you enter the restaurant there is a large, casual dining area with communal tables. They have a deli counter in the front where you can order containers of their sides, proteins, or even family meals to go. 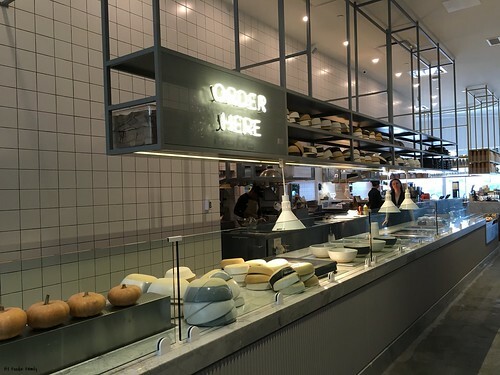 As you make your way towards the back of the restaurant there is the ordering area, where you can customize your Marketbowl or Melting Broth, the restaurant’s main lunch and dinner dining options. At the end of the counter is the Chef’s table. Here you can sit and dine while watching the chefs prepare a variety of toasts and vegetable charcuterie. And finally at the back of the restaurant is dining area. There are several seating areas with marble table tops adorned with tiny succulents. When designing this Rye Brook restaurant, creative director Melanie Masarin and founder Adam Eskin were all about cutting open the ceiling to place a giant, elevated sky light. They also added a giant window in the back of the restaurant, to allow for lots of natural light into the space. The result, is a bright and beautiful dining room. 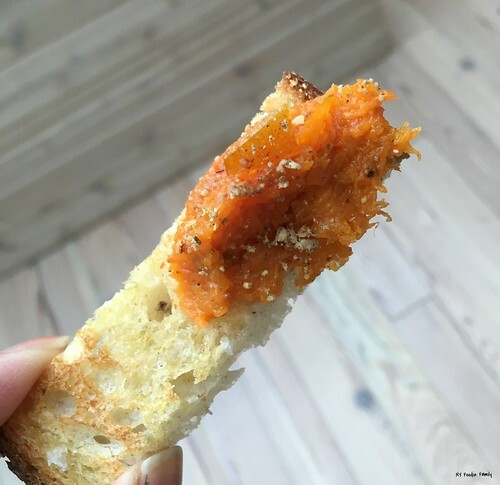 I was able to sample the three different toasts that they offer, including this one topped with roasted pumpkin with pepitas and pickled chiles. I also tried the lemon ricotta with truffle, black pepper and honey and the smoked whitefish with red grapes and soft herbs. I can honestly say they were all delicious. Vegetable charcuterie offerings from the chef’s table include this Yukon Gold potato terrine topped with smoked salmon, creme fraiche and Mutsu apple. I also tried Celery Root Pastrami as well as this Parsnip Marrow Bone with celery leaf and black truffle. It was interesting to see a vegetarian take on what would normally be a meat dish. I got to meet Chef Matt Weingarten, Dig Inn’s culinary director. He spoke with us about Dig Inn’s mission, which is to build community through food. He noted that their menu is mostly vegetables and all dishes are cooked fresh. He enjoys the open kitchen design (pictured above) which allows the chefs to engage with diners. 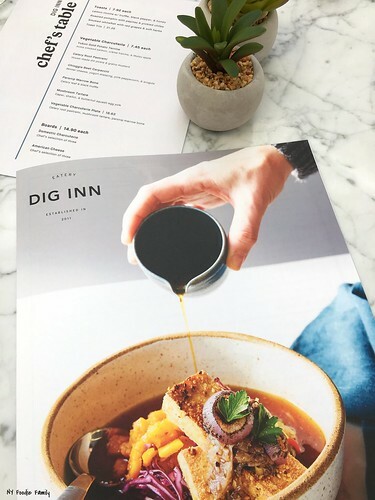 The Dig Inn menu is seasonal and they are currently featuring their Winter menu, which as I mentioned features the Marketbowls and Melting Broth. 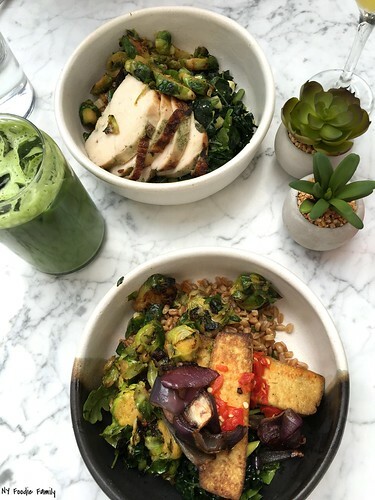 My friend and I shared Marketbowls that had a base of toasted farro, sides of Brussels sprouts and kale, apple and blue cheese salad and were topped with Herb Roasted Chicken and Grilled Organic Tofu. These bowls were hearty and delicious and I love that they are customized. The combinations are endless! I also got to sample a side of the Seasonal Upstate Mac and Cheese. It was creamy and cheesy. 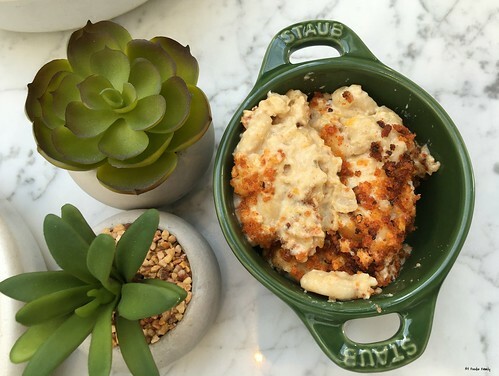 Honestly though, I would choose one of the amazing veggie sides over mac and cheese! And to end the meal, I sampled the Kitchen Sink Cookie and Organic Dark Hot Chocolate! Dig Inn serves a variety of drinks including wine, beer and hard cider. I tried unsweetened raspberry iced tea and an Iced Matcha Latte. While the matcha latte was good, it needed sugar to sweeten it up. 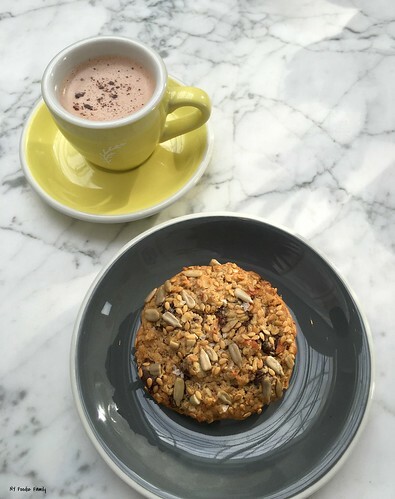 Dig Inn Rye Brook is open seven days a week and serves breakfast as well as lunch and dinner. Check the website for specific times. The breakfast menu includes a variety of bowls as well as an egg sandwich, frittata, avocado toast, a quinoa waffle and more! And for those families with young children, have no fear. 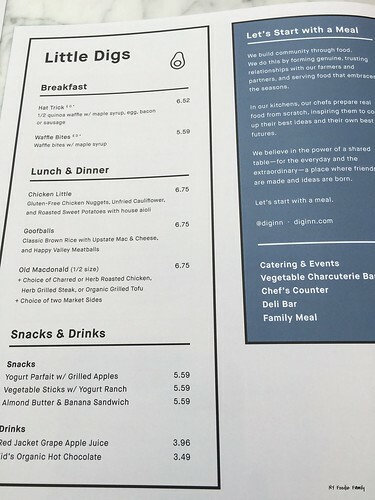 Dig Inn offers a Little Digs menu with a variety of dining options sure to please. While there’s no age specifications on the children’s menu, my eight and ten year-old would love the Old Macdonald. Otherwise, they could easily share a regular Marketbowl. Everything I ate at Dig Inn was delicious. For those of us who live in Northern Westchester, getting to Rye Brook is a bit of a drive. However, if you are in the White Plains area (and really, who doesn’t travel down to there frequently?!) Rye Brook is close by. Be sure to stop by and give the newest Dig Inn a try! I am a Hudson Valley Restaurant Week Grazer. In exchange for posts about my HVRW experience, part of this meal may have been compensated. However, all thoughts and opinions are my own. This past Wednesday, I got the rare chance to have a lunch date with my husband. 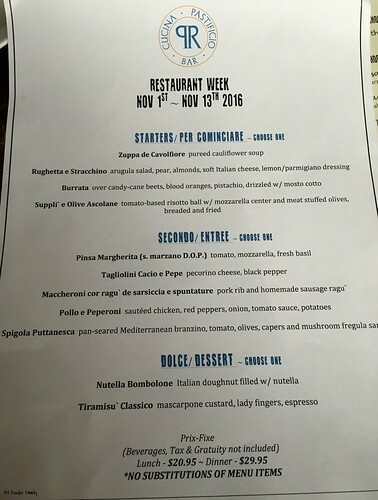 Hudson Valley Restaurant Week (HVRW) ends this Sunday the 13th and I wanted to get another delicious three course meal in! Since my husband works in White Plains, we had several options for lunch. We had heard good things about Pax Romana – homemade pasta and great pizza? We had to try it! 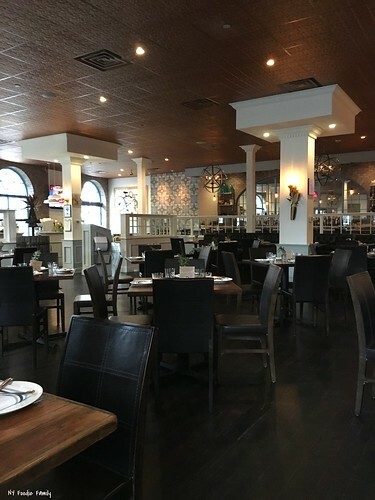 The restaurant, which opened in February of this year, is located at 189 East Post Road in White Plains in the former Taleggio space. Pax Romana is open every day beginning at noon, serving both lunch and dinner. Although they don’t take lunch reservations, the dining room is spacious with lots of seating. Be sure to leave room for some gelato, which you will see in the case on the left when you first enter the restaurant! I enjoyed the casual modern decor of the restaurant including the graffiti wall and arched windows. Vintage kitchen accessories were showcased on shelves, hung from the ceiling and decorated the walls. Vases of fresh herbs were placed on each table. Pax Romana has one HVRW menu and serves the same dishes for both lunch and dinner. The restaurant also has a regular $10 Pax Lunch menu, which my husband ordered from. This menu includes a choice of soup, salad or fries with one of the listed entrees. Before we even ordered, crispy, herbed bread sticks were placed on the table. For my starter I ordered Suppli’e Olive Ascolane. All menu items are listed in Italian and English. 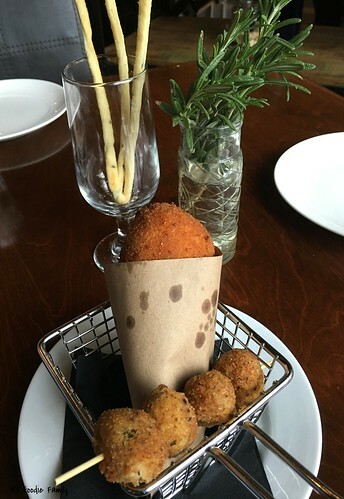 This is a large, fried risotto ball with mozzarella cheese in the center. It was served with four meat stuffed olives, also fried. I enjoyed this appetizer a lot, which I shared with my husband. My husband ordered the soup of the day as part of his lunch special. 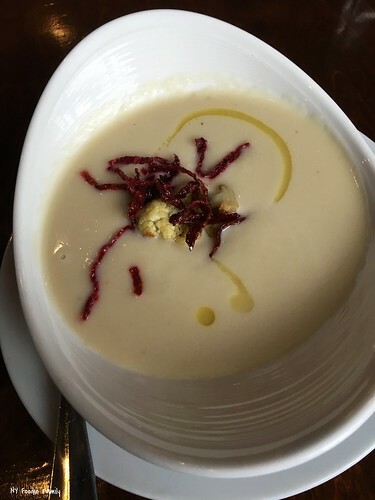 The soup, Zuppa de Cavolfiore, is the same pureed cauliflower soup offered on the HVRW menu. This soup was smooth and creamy. For his entree my husband ordered the Maccheroni cor Ragu de Sarsiccia e Spuntature – macaroni with pork rib and sausage ragu. This pasta dish is also offered on the HVRW menu. He wanted to try the homemade pasta and this dish stood out to him. It was flavorful, hearty and filling! For my entree I ordered the Pinsa Margherita. 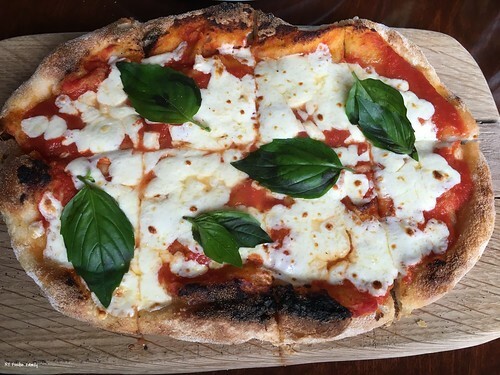 Pax Romana is the only restaurant in New York that directly imports Pinsa Romana flour directly from Rome, which they use to make their pizza. This pizza had a light, crispy crust. With just san marzano tomatoes, mozzarella and fresh basil, this pizza proves that good quality, simple ingredients can make a delicious dish. My husband’s lunch special did not come with dessert. 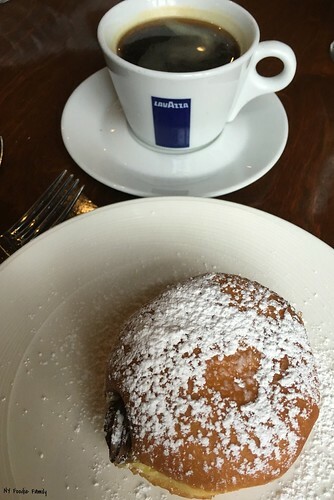 However, the Nutella Bombolone, a Nutella-filled Italian doughnut, was big enough for the two of us to share. This doughnut is stuffed with Nutella and was a sweet ending to our meal. Overall, we had a great lunch at Pax Romana during HVRW. The servings were generous in size and delicious in taste. Service was friendly and attentive. We will have to return and try the gelato since we didn’t take our own advice and had no room for the extra dessert! Hudson Valley Restaurant Week (HVRW) started this past Tuesday. From November 1 – 13, hundreds of restaurants throughout the Hudson Valley are offering a three-course prix-fixe menu. I started HVRW off with a bang yesterday when I ate lunch at Purdy’s Farmer & The Fish. The restaurant is located on Titicus Road in North Salem, right off of I-684. The restaurant is located in an 18th century house. When I arrived I got a quick peek at the inside dining area. Although small, it has a quaint and cozy feel. Since the weather was so beautiful, my dining partner, fellow blogger, Ashley at Big Flavors From a Tiny Kitchen, and I opted to sit outside on the porch. Purdy’s Farmer & The Fish is a farm-to-table seafood restaurant run by Executive Chef, Michael Kaphan and Chef de Cuisine, Kevin O’Neil. 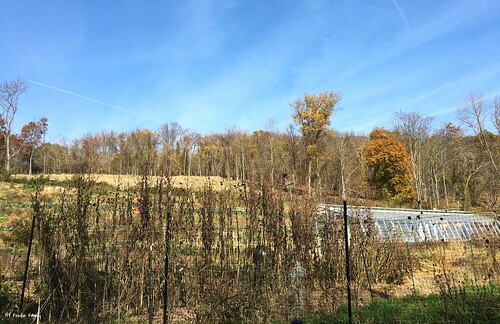 More than 3/4 of the vegetables used in their dishes are grown on the four acre farm located next to the restaurant. The seafood used in the restaurant is provided exclusively by Down East Seafood. The company is committed to sustainability and the environment and its founder, Edward Taylor is also co-founder of the restaurant. Adjacent to the restaurant is the Farm Shop where you can purchase fresh seafood and produce grown on the farm. Local grass-fed meats and goods from other local vendors including pasta and cheese are also available for purchase in the shop. 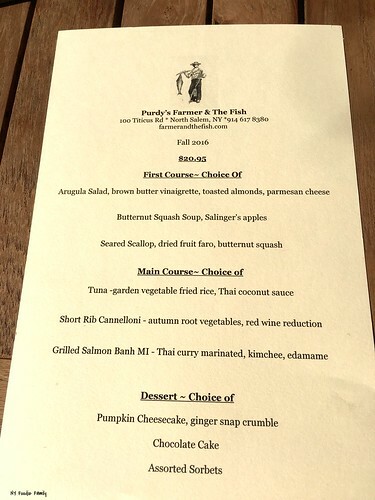 Purdy’s Farmer & The Fish offers a lunch menu only for HVRW. While the restaurant week menu isn’t posted on the Valley Table participating restaurants page, it’s available on the restaurant’s website. For $20.95, you get a choice of a First Course, Main Course and Dessert. I highly recommend the seared scallop for the first course. The scallop was cooked well and paired nicely with the slight chewiness of the faro. Add in the sweetness from the dried fruit and butternut puree and this was an explosion of flavor. 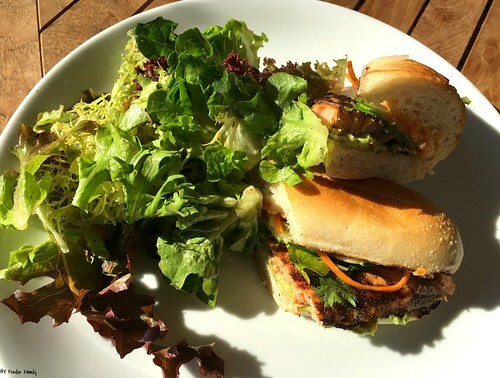 For my main course, I ordered the Grilled Salmon Banh MI. The salmon rested on a layer of edamame puree and was topped with a kimchee spread and pickled veggies. This was all sandwiched between a medium-sized roll. I loved all the Asian flavors of this sandwich! It was served with a mixed greens salad, which I didn’t eat very much of. I was getting full and had to leave room for dessert! 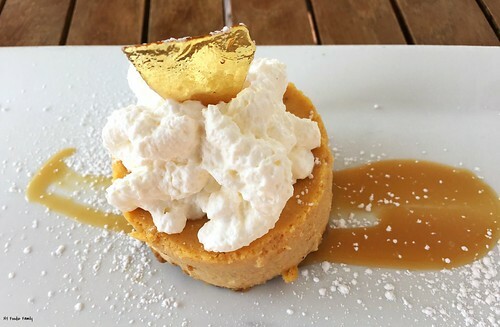 Speaking of dessert, I ordered the Pumpkin Cheesecake. The cheesecake was creamy with noticeable pumpkin flavor but wasn’t overly sweet. It was the perfect ending to a delicious meal. I was surprised at how busy the restaurant was at lunch time on a Wednesday afternoon. Despite the filled tables on the porch, our server Lindsey was friendly and attentive. I enjoyed a delicious lunch here and I highly recommend visiting Purdy’s Farmer and The Fish during HVRW! If you can’t make it for HVRW, the restaurant offers a nice variety of fish and seafood dishes for lunch and dinner. Clams, Alaskan Crab Legs and a variety of oysters are some of the goodies available from the raw bar. Burgers and fried chicken are some non-seafood options. 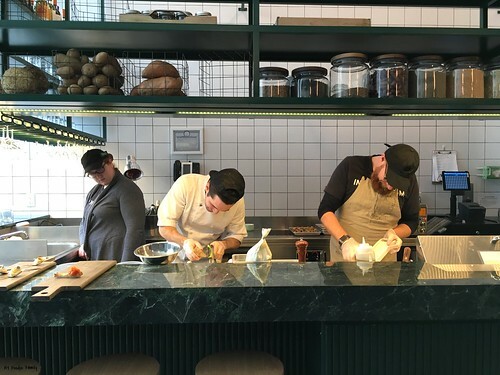 The owners recently opened Gramercy Farmer & The Fish in New York City, creating dishes using fresh fish and produce from the Purdy’s farm. 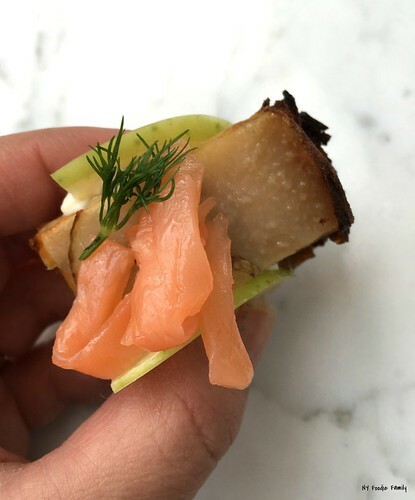 Later this month, sister restaurant Hudson Farmer & The Fish will be opening in Sleepy Hollow, adding to the Westchester County restaurant scene. Are you looking for a casual, family-friendly restaurant in Northern Westchester? 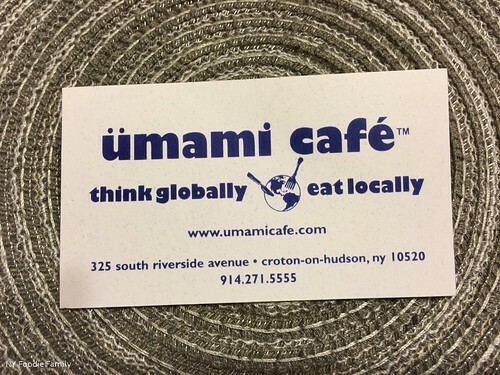 Umami Cafe in Croton-on-Hudson fits the bill. 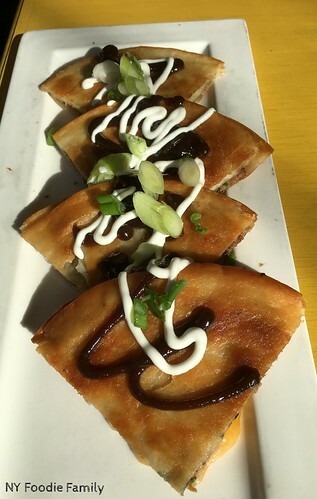 Umami Cafe is aptly named after the fifth primary taste (umami translated from Japanese meaning “pleasant savory taste”), as the restaurant offers a menu of dishes featuring flavors from all over the world. Umami Cafe opened in 2002. 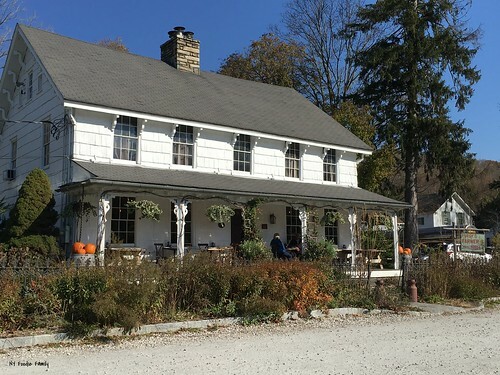 Owners Jonathan Pratt and Craig Purdy also own Peter Pratt’s Inn in Yorktown Heights and Tagine Restaurant & Wine Bar, also located in Croton-on-Hudson. The restaurant is conveniently located on South Riverside Avenue and has its own parking lot. I mentioned that the restaurant is family-friendly and they really make an effort to cater to children. Near the entrance sits a shelf of toys that kids can grab and bring to the table to play with. The children’s menus are seen via a Viewmaster, bringing back fond childhood memories! We prefer to have our kids not order from children’s menus whenever possible. 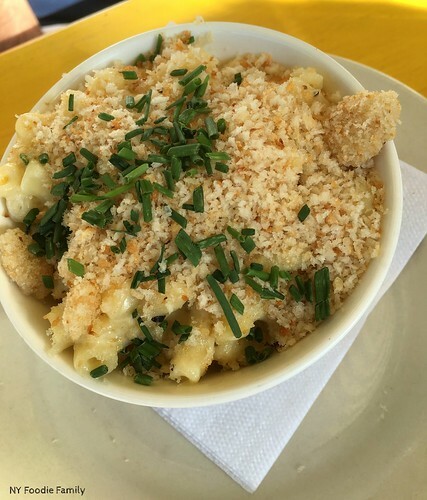 Even though the kid’s menu is cool to view, it still offers the usual chicken fingers, mac and cheese, pasta with butter or tomato sauce and grilled cheese. The most interesting items are a Fluffernutter (Marshmallow fluff and peanut butter) or Fluffer-Nutella sandwich, both which can be easily made at home. In contrast, the adult menu offers many interesting dishes. Main entrees include Grilled Salmon with Yuzu Ponzu, a Lobster Roll, Grilled Marinated Shrimp Siracha, Curry Wurst, a Bahn Mi Grilled Chicken Sandwich, Vietnamese Pork Chop, Evil Jungle Prince (spicy chicken curry), Barbecued St. Louis Ribs and more! They sell a variety of wines by the glass and bottle. If you prefer, you can bring your own bottle and pay a $10 corkage fee. There are a limited number of draft and bottle beers on their menu as well. 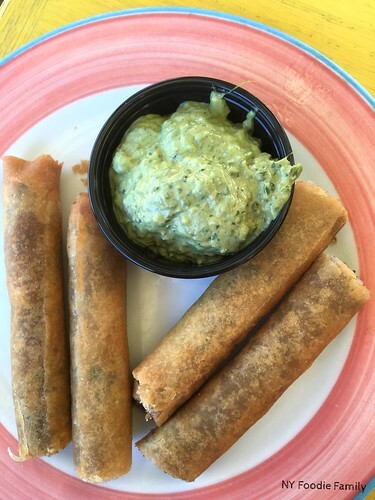 These appetizers are normally priced between $6.75 and $8.95 each but on Thursday nights, they are only $5 each. 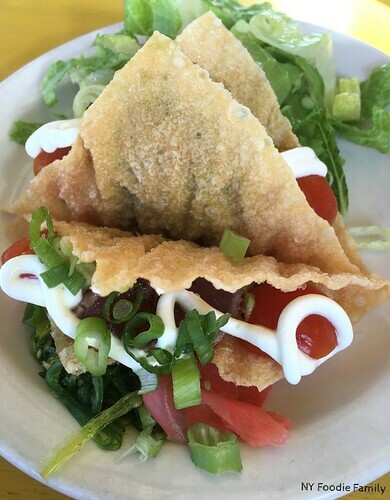 We’ve eaten here several times and had tried all the appetizers before except the Gnocchi with Duck Confit and the Seared Ahi Tuna Mini Won Ton Tacos. Everything was delicious! My son found the wasabi sour cream to be a bit too spicy on the tacos but my husband enjoyed them. We were satiated with our appetizers for dinner but didn’t leave stuffed. We didn’t even look at the dessert menu, as we planned on making a stop at the nearby Hot Dippity Donuts! The restaurant does not take reservations, so we always make sure to arrive close to opening. They are open daily from 5 PM to 9:30 PM Sunday through Thursday and from 5 PM to 10 PM on Friday and Saturdays. In addition to their $5 appetizer night on Thursdays, Umami Cafe also has a $10 burger night on Tuesdays. Yet another reason for us to return! 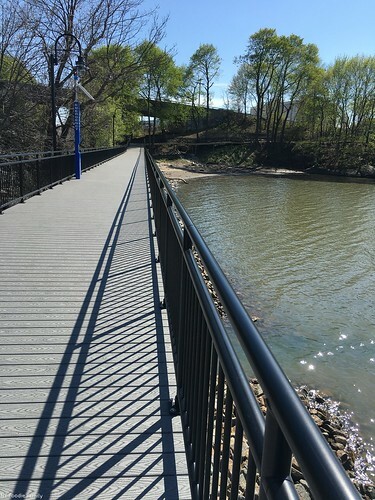 A couple of weekends ago, our family visited the recently completed section of the Westchester RiverWalk in Peekskill. 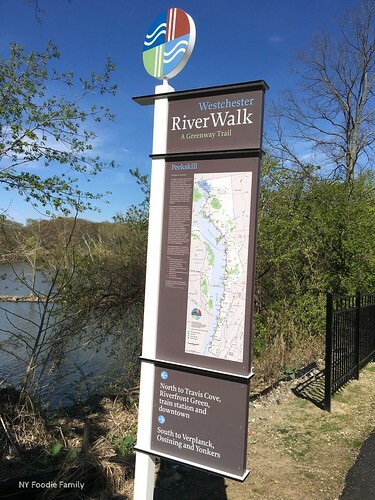 When completed, the Westchester RiverWalk will be a 51.5 mile trail along the beautiful Hudson River. This project started in 2004, will span the entire county from Yonkers to the Putnam County border by the Bear Mountain Bridge. We parked at the Metro North Peekskill train station, which has free parking on weekends. We spent some time walking around the Riverfront Green Park viewing some of the sculptures that are situated throughout the park and just taking in the awesome views of the Hudson River. 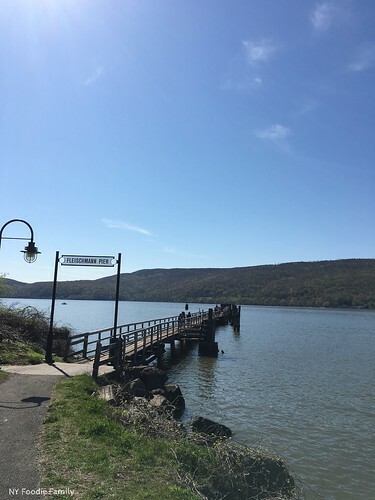 We then walked south on the paved pathway, past the Peekskill Yacht Club until we reached Fleischmann Pier. We walked out onto the pier and were able to see the Bear Mountain Bridge in the distance. After our little break we headed back to the Riverfront Green Park. We only walked a very small section of the RiverWalk. There were benches throughout the path for those who would like to sit and take a rest. We saw lots of people on the path, including those walking their dogs, joggers and others like our family, taking a more leisurely stroll. Biking is allowed on the path, except for the bridges, where signs indicate that bikers must dismount when crossing. Our kids aren’t the best bikers and the path isn’t super wide, so I wouldn’t feel comfortable having them bike this particular section of the RiverWalk. 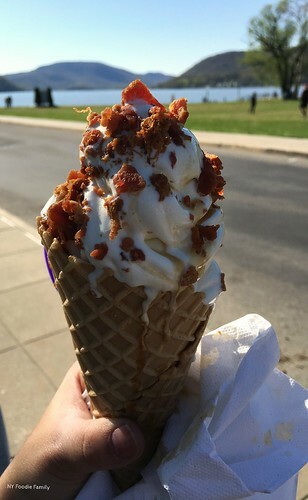 Once we got back to the Riverfront Green, we made a stop at the Hudson Creamery for an ice cream treat. The Breakfast Club Signature Sunday was delicious! We visited the RiverWalk on a really beautiful day. I highly recommend walking a section of the RiverWalk, whether it be in Peekskill or another section of the trail. 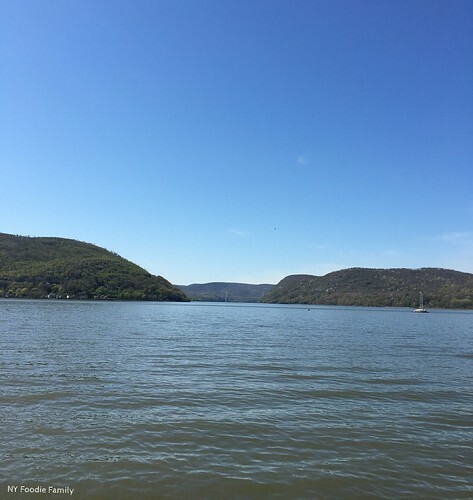 You get to spend FREE, quality time with the family outside along the beautiful Hudson River.